This DPMS style .308 rifle kit includes one 80 percent .308 lower receiver. This .308 receiver set also includes one .308 stripped upper receiver. The lower receiver magwell has already been fully broached. As additional machining is required, this is NOT an FFL item. Are you building your own AR-10? Start with the right parts when you shop .308 rifle kits and parts online here at Thunder Tactical. 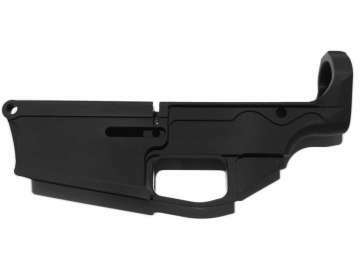 This receiver set includes one 80 percent .308 lower and one .308 stripped upper. Additional machining will be required on the lower receiver for the fire control group, trigger pin, hammer pin, trigger slot, and safety selector hole. Keep shopping our selection of rifle parts to find .308 rifle barrels, bolt carrier groups, and more.